Viknesh Vijayenthiran September 4, 2018 Comment Now! Audi's first volume electric car, the e-tron, is almost here. Production of the first customer example, finished in Catalunya Red, was completed on Monday at the car's plant in Brussels, Belgium, a high-tech facility where automated transport systems bring the batteries to the assembly line just in sequence. 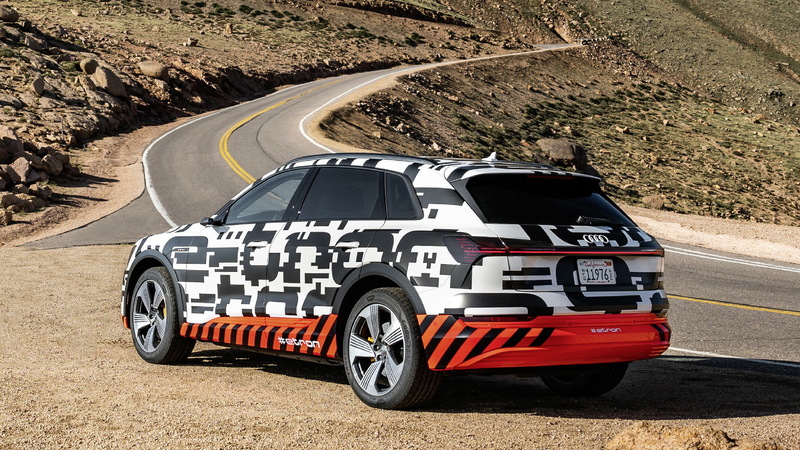 The e-tron will be unveiled to the public on the evening of September 17 in San Francisco and start deliveries in early 2019 as a 2019 model. If you want to be among the first owners of the electric SUV, make sure to put in a reservation when order books open alongside this month's reveal. With the date so close, Audi has locked in some of the e-tron's specs. The vehicle at launch will offer a peak 402 horsepower and 489 pound-feet of torque from a pair of electric motors, one at each axle. However, this peak rating will only last for 8.0 seconds. Think of it as something like an overboost function. In normal conditions, the e-tron will deliver 355 hp and 413 pound-feet of torque. 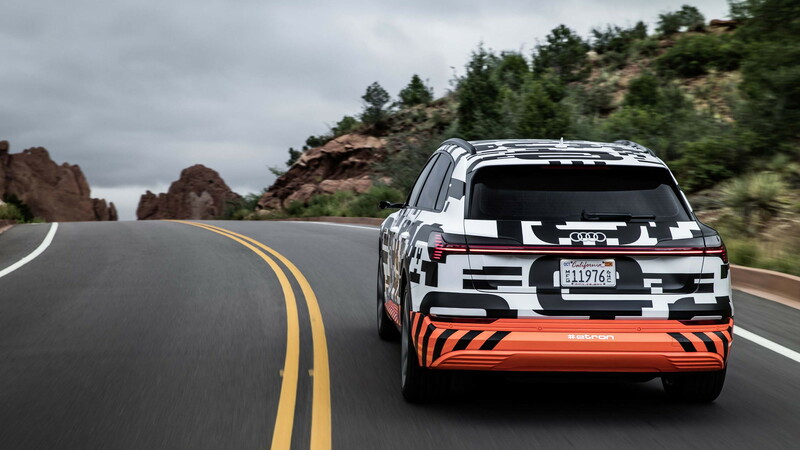 Audi says the e-tron will accelerate from 0-60 mph in less than 6.0 seconds. That's not exactly exciting in the world of electric cars, but you can bet Audi is planning quicker versions of the e-tron. As a comparison, Jaguar's I-Pace has a similar output to the e-tron and hits 60 in 4.5 seconds. And versions of the Tesla Model X will hit 60 in a little over 3.0 seconds. 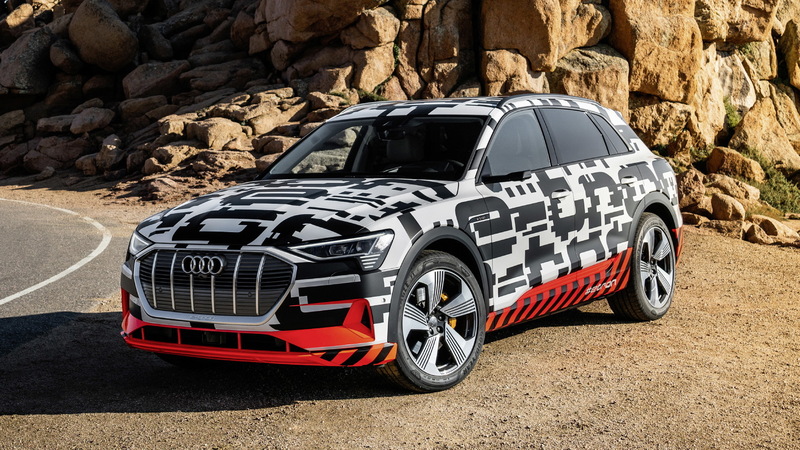 Some readers will recall the original e-tron quattro concept unveiled in 2015 to preview the e-tron had an electric motor at the front axle and two more motors at the rear. Output here was around 430 hp, though it too had a boost function to lift output to 496 hp momentarily. It's possible we'll see this configuration in a more potent e-tron, perhaps one wearing an S badge. Like in the e-tron quattro concept, the production e-tron will come with a 95-kilowatt-hour lithium-ion unit. As we found out in our recent ride in a prototype, the e-tron will have some pretty powerful regeneration to help charge the battery. Using European standards, Audi promises roughly 250 miles of range with about 30 percent of that coming from expected recuperation. Otherwise, a 150-kilowatt fast-charging system will provide 80 percent charge in about 30 minutes. Sadly, the e-tron's cool-looking cameras and door-mounted screens that replace the traditional side-mirror won't be offered in the United States, since they don't meet standards here. Hopefully that changes soon. 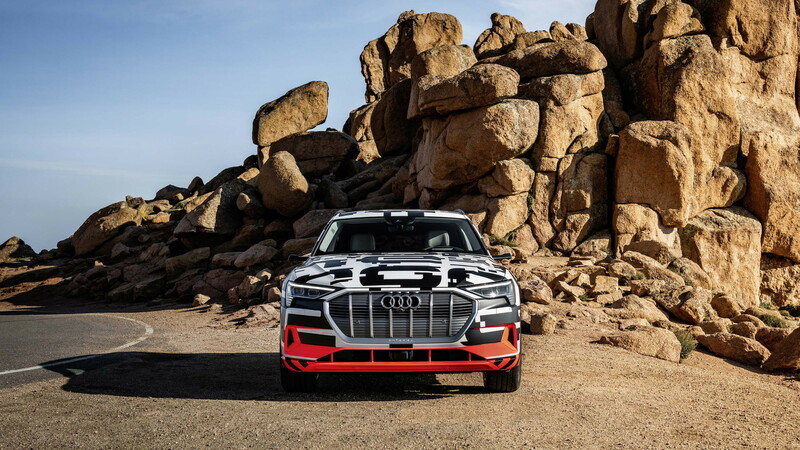 To reach that level, Audi plans to offer an electrified version of every vehicle in its lineup by the 2025 date. And most of the electrified cars will be pure electrics, with a smaller proportion as plug-in hybrids. Beyond the e-tron, Audi will introduce two more electric cars by 2020. One will be a more coupe-like version of the e-tron and the other is expected to be an electric compact car, possibly based on the A3. A high-performance e-tron GT sedan and two small SUVs are expected to follow early next decade.